Natural mineral water and antioxidant extract rejuvenate the skin, reducing various signs of aging. Various minerals such as Calcium and Magnesium keep the skin well nourished, and the nutrients are quickly absorbed to retain gorgeous skin. This ampule contains Arbutin which gives exceptional whitening effect to keep the skin looking bright and clear. Improves blotchy and uneven skin, and boosts brighter skin tone. that are quickly absorbed by the skin. Restore the skin’s natural balance with preservative-free plant-based ingredients and complex mineral water. 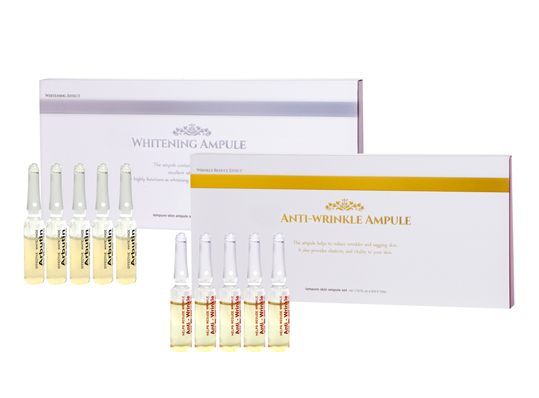 The ampule helps to reduce wrinkles and sagging skin. It also provides elasticity and vitality to your skin. rich moisture and nutrients to revitalize the skin. Approved by the KFDA as an anti-wrinkle agent, Adenosine lifts wrinkles and sagging skin to renew gorgeous healthy-looking skin. natural ingredients which is helpful to absorb products quickly. Keeps the skin balanced with preservative-free plants ingredient which is applied by safety system and complex mineral water.